A while ago, I reached out to Temp0 to try to figure out what his favorite food was and he responded with “baked ziti with pepperoni topping”. 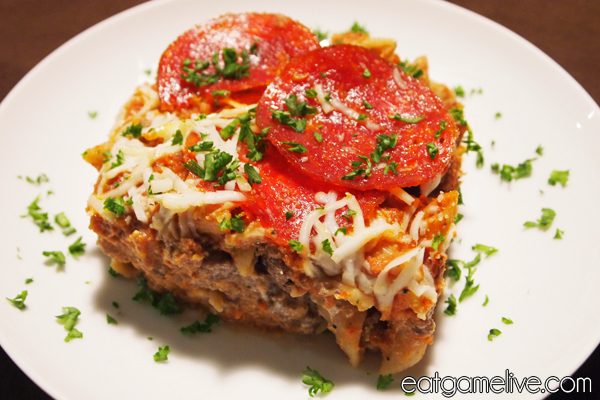 I’ve never tried making baked ziti before, so this would be a slight challenge for me. I think they’re pretty rad songs and even if you’re in-tune with the StarCraft II community, you still might find his songs pretty amusing. That’s why I think Temp0 is pretty cool; he’s taking care of the StarCraft II community by creating content. When people are actively making positive fan creations, you know you’ve created a good game that people are passionate about. And thus, a good game can spark the creation of a solid community. When there’s a solid community, people may be inclined to stick with a game longer than average. A solid community is important to your game’s health. So game devs and game managers, love those who share their passions for your game! I’m a huge supporter of gaming communities, which is why I like to reach out to people from all walks of life and all types of games. And this leads me back to this recipe: Temp0’s baked ziti. This recipe is pretty simple to make, but you’ll be wishing you made more. I snuck in some vegetables into the sauce base, so this recipe is perfect for those who want to get their daily serving of vegetables. But more importantly, it’s cheese and meat… How could possibly you go wrong? Extra tools you will need: Baking dish (15″ x 10″ x 2″ is what I used) and a food processor or blender. Total prep time will take about 50 minutes. Total cook time will be about 45 minutes. This will make 8 servings. *note: The ingredients used in this recipe were the lower-calorie/lower-fat options (such as 90%/10% ground beef and fat-free ricotta cheese. If you plan to use higher fat content ingredients, your calories per serving will be much higher). Dice garlic and reserve half for the vegetables. Heat a skillet on high and add half of your olive oil. Cook your ground beef. Season with salt, pepper and oregano. When beef is done, remove from heat and set aside. When water begins to boil, add pasta and salt. Make sure to stir the pasta occasionally in order to prevent the pasta from sticking together. Allow pasta to cook and strain once the pasta is done. Place your pasta in a baking dish. 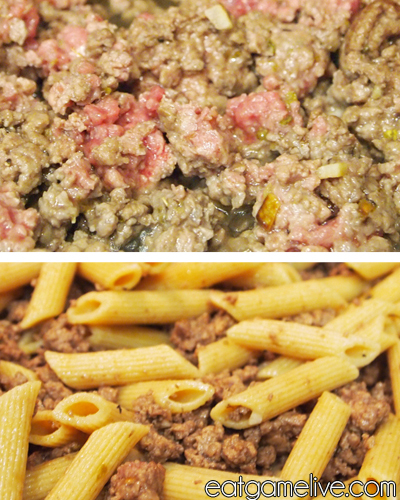 Add your ground beef to the pasta and stir. Roughly dice your zucchini, onions and squash. 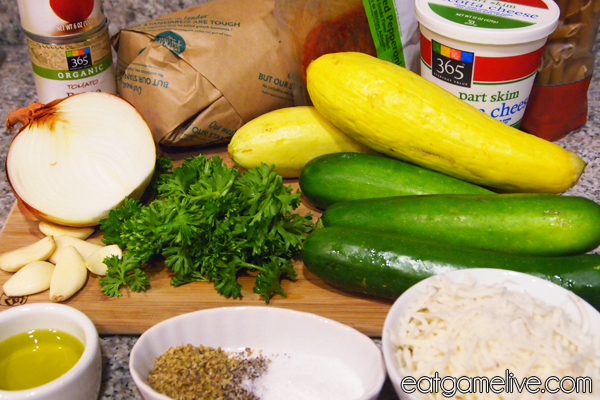 Since these ingredients will be blended to make the sauce, you can do a quick and rough cut. In the same skillet you used to cooked the beef, add in the remainder of your olive oil. Place your vegetables in the skillet and season with salt, pepper and oregano. Saute your vegetables until soft (about 10 minutes). 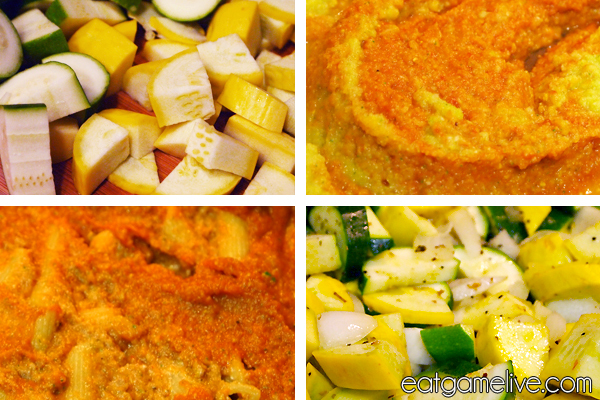 When vegetables are done, remove from heat and place vegetables in a food processor. Blend your vegetables until a smooth sauce forms. Remove from the food processor and place the sauce back into the skillet. Stir in your tomato paste and set aside. Preheat your oven to 450° F (232° C). Take 2 1/2 cups of ricotta cheese and stir it into your pasta and beef mixture. Slowly pour in 3/4 of your tomato vegetable sauce into the dish. Stir to combine. With the remaining tomato sauce, coat the top of the pasta. Take half of the mozzarella and sprinkle it over the top of the pasta. Place your pepperoni on top of the mozzarella. 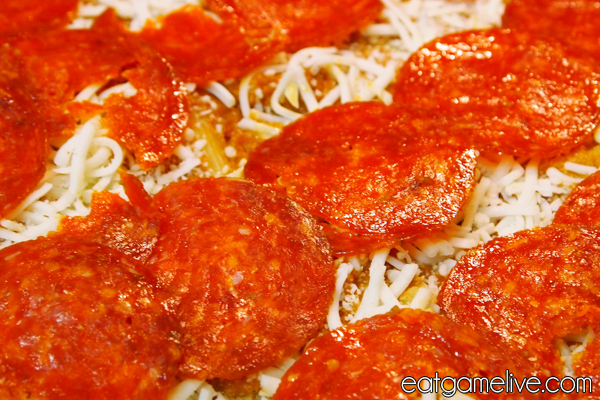 Sprinkle the remaining mozzarella over your pepperoni. Bake for about 10 – 15 minutes or until the cheese becomes golden brown. Remove from oven and let cool for about 5 minutes. If you’ve successfully followed those steps, you’ll end up with something like above! GG WP. I should mention that this pasta dish lasts for a while… My boyfriend and I are on day 3 of baked ziti feast 2013 and we’ve got one more serving left. IT NEVER ENDS! Hopefully this recipe has met Temp0’s standards of baked ziti. Like I mentioned earlier, if you haven’t already, please check out his youtube channel or watch his stream. Support your fellow StarCraft II players!